Keyboard and VGA working together AND a mystery! 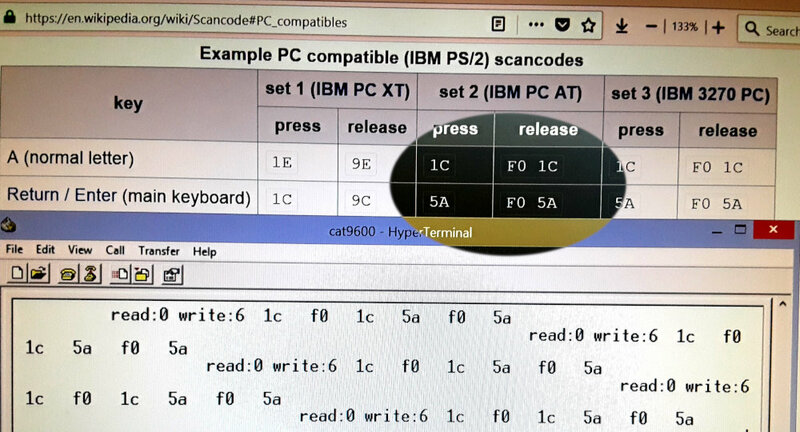 Here, a debug program is outputting the contents of the keyboard scan code buffer over the serial line. The read position is 0, and the write position is 6, meaning 6 codes are in the buffer, but none have been 'read' yet. Those bytes are: 1C (A), F0 1C (release A), 5A (enter), F0 5A (release enter). That's what I typed. And for a few days, that's what I would type, but not what would show up here! I had VGA and video working together a few days ago. I took the 'cheat' route and just had a pin change event blank out an entire scanline. It worked perfectly. At a 30 Khz screen, if the keyboard is up to 15 khz, and the clock has a 50% duty cycle, the routine should be able to sample the bits just fine if it looks once per scanline. And it worked just fine. If this is an active video scanline, and the pin clock changed, handle it AFTER the video, and then jump back into the next scanline handler. No return touser program, until there's either a blank line, or the keyboard clock is idle. I thought I could do the same in this project. It did not work in this case. Then I remembered that the sampling has to be at the same time every scanline. If sometimes I sample at the beginning (for a blank line), or at the end (for an active line), the important bit transition may have been missed. Basically if the ps2 pin clock is 50% duty cycle, if I don't sample evenly, something will be missed. So, instead I changed it to sample at the beginning of the scnaline cycle, at hsync, exactly at the same clock every scanline. This also didn't work! So I went back to the simple version that blanks out a scanline. (Thanks git!). And I ran by sample-and-save code immediately after my load-and-act code, and it still didn't work. Why the hell not? Well I have two versions of the sampling code here, both almost identical, and in the AVR simulator do the exact same time. One works, one does not! I even padded the working one with a NOP to make the io timings the same! //also, clearing an already clear flag should do anything. It doesn't in the atmel simulator! I plan to apply this fix to the complicated version, and then move on to the SD card.